Self-acclaimed Black Jesus and Living Perfect Master, Sat Guru Maharaj Ji, in this interview with Premium Times speaks about the forthcoming elections and revealed the two journalists that wrote about his death rumours last year died within 7 days. Enjoy! PT: The elections are a few days away. What are your thoughts on what have been happening so far? 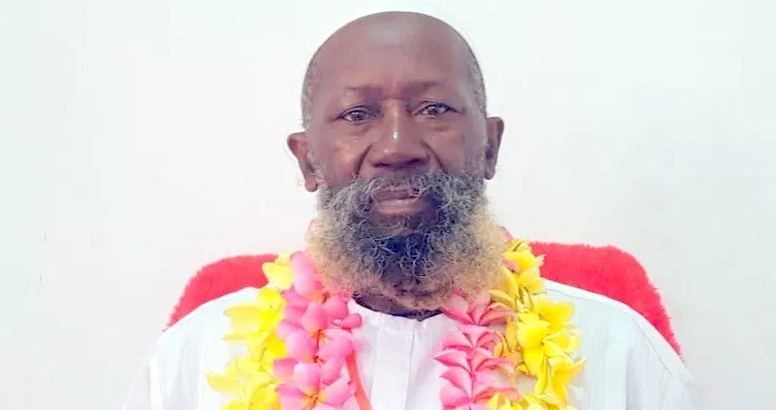 Maharaj Ji: The political climate is not different from the post independent Nigeria where the independence was given on a platter of convictions and reconnect. And so we find out that because the people who have been given this form of government to practice, they don’t know how they came about, so you find then working in a kind of trial and error. And so the situation now can be said to be, yes, okay because I am here. And because I am here, the fear of God – in bracket Marahaji – is deeply getting into them. That’s why today we don’t see violence, we don’t see any kind of threats here and there. People are saying what they want to say, people are talking what they want to talk, but they have not got to the real point and the real point is what system are we going to use? Is it going to be presidential system that has turned all our leaders into stealocrats? Stealocrats in the sense that monies meant for initiatives like heavy constructions, heavy industries that will uplift the the people for their names to be written on the sands of time have been diverted. You will find out that we are now producing illiterates, unskilled labour who are now being used as mules, area boys, thugs and so on. So, we now have to ask ourselves: what is the way forward? The way forward is that, unlike other nations, Nigeria is so blessed, heavily blessed to have someone who is a Living Perfect Master. And if you want to succeed it is onto him we have to look up to and ask him: how did it happen for us to become slaves today? If we are the negros race, the beginning of civilization, the architect of great science, technology and all areas of human endeavour. What happened? Until that is done, even though the whole situation might look rosy, but there is danger there. Why? Because we have the raw materials, we have the human resources but that area is still always being ignore. So just like somebody who has abandoned home and now living in the forest, time and time again wild animals are coming you ran back home. So the climate is okay because I’m here. It is up to to the people now to decide which way to go. PT: You keep saying ‘because you are here.’ Are you going to be here forever? What happens when you are not here? Maharaj Ji: I am never partisan, I’m fully involved. As a father of creation, my own duty is to make sure that whosoever is there is able to captain this boat called Nigeria into a successful end. And so right from the… if you check my antecedents, right from the time of Shagari I have been communicating, telling them ‘don’t follow the European way,’ they are from the cold and we are from the warm. More or less, they are the mind the black is the heart. The black is the origin of man. So I have been communicating with them through circulars, press conferences. Apart from giving knowledge, saving lives, the next thing is on the political situation. When I was young, if you read any paper from Russia they’ll tell you you’re a rebel. Gradually as we were becoming wiser, growing up, they dropped that idea they are bring in globalization and all those things they don’t mean anything. I have my raw materials, I’m the one to use it the way I want. Even if you present something, I cannot just carry everything hook and sinker, this is what is worrying our people now. They are aping and that’s what I’m telling you, they should stop aping let’s go to our village because the old scientist are still there. How do we go to our village? It’s start from here, unquestionable law, whether you are PPP, AAA your objective is to make Nigeria great and so today I am always communicating with them. PT: (Cuts in) So you’re not predicting? Maharaj Ji: I’m not predicting. He has to be there. Nobody can kill him to make sure that the elections holds. Of course, that does not mean that I will not tell him off if he messed up. Like when Jonathan was there, I walked out. I’ve been a very constructive part of this process of bringing Nigeria, Africa even the globe out of the present mess we find ourselves through racism that gives birth to tribalism, ethnicism, all these impurities within man. So I’ve been actively involved right from Shagari to Yar’Adua and then Jonathan and, of course, the present regime. But then, one thing is this, tomorrow, if he starts messing up I will tell him ‘Ol’boy, you’re going out of the way’ because that is what is needed for anybody who is in power. He must be seen to be near perfect, his love must be real because he is in a position that is very important, especially now that we are seeing that the black race is trying to now participate in the global politics as a leader. Maharaj Ji: My ears are not meant to listen to such information. Through out, I don’t listen to anything negative, anything causing anger, fear, and doubt. Why? When I heard about it, it was through my media men. They said Maharaj Ji, this is what is going on. I said okay what do we do, they said they will reply them, as in arrange an interview. I said okay because as the high chief of culture and tradition, when people are saying such things about you, it means you are going to live longer. And you can’t blame our people because they are manipulating the ignorant ones. Because you cannot mock this power with death and go free. I was told that the two officers that were used to carry out this rumour, one from Sokoto and one from Oyo, they changed body within seven hours after the announcement. And I don’t blame them, because why? I have been shouting and screaming for years now. Why is it that Maharaj Ji is talking about knowledge, power, and even the books have said knowledge is power, it’s not knowledge of physics. So I was okay, they had to try me. Maybe because they didn’t see me coming out as usual, I don’t know, some of my informations are blocked. You know Nigeria has changed, there is press freedom but is no news freedom. A news that are coming out is based on how much you can pay, and how do you expect me to be paying? What for? When what I’m saying is genuine, perfect and is the only message that humanity needs to know in order to change things for good. So I was okay, I came out people were surprised and that is just the beginning because those who carry those messages today they are regretting. Publicity is now going up again so everybody running saying Guru has come again, now we can’t steal money, now we can’t fight everybody, we have to leave here for elsewhere. Where are they going that I will not see them? PT: When you said the two people that started your death rumour ‘changed body,’ what did you mean?